SD Olinger, DA Wiens, BP Lipovsky, R Aster, A Nyblade, R Stephen, P Bromirski, P Gerstoft, Z Chen Tidal and thermal stresses drive seismicity along a major Ross Ice Shelf rift, submitted 6 February. Baker, M.G., Aster, R.C., Anthony, R.E., Chaput, J., Wiens, D.A., Nyblade, A.,Bromirski, P., Stephen, R., Gerstoft, P., The Environmentally Forced Vibration Spectrum of the Ross IceShelf Observed with Broadband Seismographs, Annals of Glaciology, submitted 26 jan.
Mark Wagner, Yongsung Park, Peter Gerstoft, Woojae Seong, Gridless Direction of Arrival Estimation via Alternating Projections, submitted 24 December. Michael J. Bianco, Peter Gerstoft, Kim Olsen, Fan-Chi Lin, High-resolution seismic tomography of Long Beach, CA using machine learning: delineating aquifers, submitted 24 December. J. Chaput, RC. Aster, D. McGrath, M. Baker, R. Anthony, P. Gerstoft, P. Bromirski, A. Nyblade, RA. Stephen, D. Wiens Near-surface environmentally forced changes in the Ross Ice Shelf observed with ambient seismic noise, Geophys Res Letters, doi.org/10.1029/2018GL079665 . AGU press coverage, EOS press coverage, and	Stephen Colbert has discovered my research on Antarctica! Weitao Wang, Peter Gerstoft and Baoshan Wang (2018), Seasonality of P wave microseism from NCF-based beamforming using ChinArray Geophys. J. Int, doi.org/10.1093/gji/ggy081. Haiqiang Niu, Emma Ozanich, Peter Gerstoft (2017), Ship localization in Santa Barbara Channel using machine learning classifiers, J Acoust. Soc. Am. 142, EL455-460 DOI:10.1121/1.5010064. Scientic American highlighted our work on machine leaning for source localization in the ocean Listen to the 60-second science story . P.D. Bromirski, Zhao Chen, R.A. Stephen, P. Gerstoft, D. Arcas, A. Diez, D.A. Wiens, R. Aster, A. Nyblade (2017), Tsunami and Infragravity Waves Impacting Ice Shelves, JGR Oceans 122, doi:10.1002/2017JC01291. Gemba, Kay L., Santosh Nannuru, Peter Gerstoft, William S. Hodgkiss (2017), Multi-frequency sparse Bayesian learning for robust matched field processing, J Acoust. Soc. Am. 141, 3411-3420, DOI: 10.1121/1.4983467. Gemba, Kay L., William S. Hodgkiss, Peter Gerstoft (2017), Adaptive and compressive matched field processing, J Acoust. Soc. Am., 141, 92-103, DOI:10.1121/1.4973528 2017. Mecklenbräuker, Christoph F., Peter Gerstoft, Erich Zochmann (2017), c-LASSO and its Dual for Sparse Signal Estimation from Array Data, Signal Processing, 130 (2017) 204-216 doi:10.1016/j.sigpro.2016.06.029 . Das, Anup, William S. Hodgkiss, and Peter Gerstoft (2017), Multipath Resolution Using Compressed Sensing. IEEE J. Oceanic Eng, DOI:10.1109/JOE.2016.2576198 . Xenaki, Angeliki, Efren Fernandez-Grande, Peter Gerstoft (2016), Block-sparse DOA estimation for spatially extended sources in a Bayesian formulation, J Acoust. Soc. Am., 140,1828-1838, DOI:10.1121/1.4962325. Gerstoft, Peter, Christoph F. Mecklenbräuker, Angeliki Xenaki, Santosh Nannuru (2016), Multisnapshot sparse Bayesian Learning for DOA, IEEE Signal Process. Lett., Vol 23, 1469-1473 doi:10.1109/LSP.2016.2598550 , . Matlab CODE for SBL focussed on DOA estmation. Michalopoulou, Zoi-Heleni and Peter Gerstoft (2016), Passive fathometer reflector identification with phase shift modeling, J Acoust. Soc. Am., 140, EL125-EL130, doi:10.1121/1.4958983 . Sunil Rohilla, N. Purnachandra Rao, Peter Gerstoft, D. Shashidhar and H.V.S. Satyanarayana, Shear wave velocity structure of the Koyna-Warna region in western India using Ambient Noise correlation and Surface Wave Dispersion, Bull Seismological Society Am., 105, 473-479, 2015, doi: 10.1785/0120140091. Carriere, Olivier, Peter Gerstoft, William S. Hodgkiss (2014), Spatial filtering in ambient noise interferometry, J Acoust. Soc. Am. 135, 1186-1196, http://dx.doi.org/10.1121/1.4863658. Toomey, D.R., R.M. Allen, A.H. Barclay, S.W. Bell, P.D. Bromirski, R.L. Carlson, X. Chen, J.A. Collins, R.P. Dziak, B. Evers, D.W. Forsyth, P. Gerstoft, E.E.E. Hooft, D. Livelybrooks, J.A. Lodewyk, D.S. Luther, J.J. McGuire, S.Y. Schwartz, M. Tolstoy, A.M. Trehu, M. Weirathmueller, and W.S.D. Wilcock. 2014. The Cascadia Initiative: A sea change in seismological studies of subduction zones. Oceanography 27(2):138-150, http://dx.doi.org/10.5670/oceanog.2014.49. Karimian, Ali, Caglar Yardim, Tracy Haack, Peter Gerstoft, William S. Hodgkiss, Ted Rogers (2013), Towards assimilation of atmospheric surface layer using weather prediction and radar clutter observations, AMS Journal of Applied Meteorology and Climatology, 52, 2345-235, DOI:10.1175/JAMC-D-12-0320.1. Mecklenbräuker, Christoph F., Peter Gerstoft, Ashkan Panahi, Mats Viberg (2013), Sequential Bayesian Sparse Source Reconstruction using Array Data, IEEE Transaction Signal Processing, 61, 6344-6354. Tan, Bien Aik, Peter Gerstoft, Caglar Yardim, William Hodgkiss (2013), Broadband synthetic aperture geoacoustic inversion, J Acoust. Soc. Am., 131, 312-322. Xaver, Florian, Peter Gerstoft, Gerald Matz, and Christoph F. Mecklenbrauker(2013), Analytic Sequential Weiss-Weinstein Bounds, IEEE Transaction Signal Processing, 61, 5049-5062. Xenaki, Angeliki, Peter Gerstoft, and Klaus Mosegaard (2013), Modeling and detection of oil in sea water, J Acoust. Soc. Am.,134, 2790-2798. Yardim, Caglar, Peter Gerstoft and WS Hodgkiss (2013), Particle smoothers in sequential geoacoustic inversion, J Acoust. Soc. Am. 134 p 971-981,http://dx.doi.org/10.1121/1.4807819 ,. Gerstoft, Peter, Ravishankar Menon, William S. Hodgkiss, Christoph F. Mecklenbräuker, Eigenvalues of the sample covariance matrix for a towed array, J Acoust. Soc. Am., 132, 2388-2396. doi:10.1121/1.4746024. Karimian, Ali, Caglar Yardim, Peter Gerstoft, William S. Hodgkiss, Amalia E. Barrios (2012), Multiple grazing angle sea clutter modeling, IEEE Trans. Ant and Propagation, 60, 4408-4416, doi:10.1109/TAP.2012.2207033. Karimian, A., C. Yardim, P. Gerstoft, W. Hodgkiss, and A. E. Barrios (2012), Estimation of refractivity using a multiple angle clutter model, Radio Sci., 47, RS0M07, doi:10.1029/2011RS004701. Lewis, Michael and Peter Gerstoft (2012), Shear wave anisotropy from cross-correlation of seismic noise in the Parkfield pilot hole, Geophys. J. Int 188, 626-630, doi:10.1111/j.1365-246X.2011.05285.x. Menon, Ravishankar, Peter Gerstoft, and William S. Hodgkiss (2012), Asymptotic eigenvalue density of noise covariance matrix, IEEE Transaction Signal processing 60, 3415-3424, doi:10.1109/TSP.2012.2193573. Menon, Ravishankar, Peter Gerstoft, William S. Hodgkiss (2012), Cross-correlations of diffuse noise in an ocean environment using eigenvalue based statistical inference, J Acoust. Soc. Am. 132, 3213-3224, DOI:10.1121/1.4754558. Michalopoulou, Zoi-Heleni, Caglar Yardim, Peter Gerstoft (2012), Passive fathometer tracking, J Acoust. Soc. Am EL 131, EL74-EL80, doi:10.1121/1.3670004. Yao, Huajian, Peter M. Shearer, Peter Gerstoft (2012), Subevent location and rupture imaging using iterative back-projection for the 2011 Tohoku Mw 9.0 earthquake, Geophys J Int, 190, 1152-1168. doi: 10.1111/j.1365-246X.2012.05541.x. Yardim, Caglar, Peter Gerstoft, and WS Hodgkiss (2012), Sequential geoacoustic inversion at the continental shelfbreak, J Acoust. Soc. Am 131, 1722-1732, doi:10.1121/1.3666012. Gerstoft, Peter, WS Hodgkiss (2011), Improving beampatterns of 2D random arrays using convex optimizationJ Acoust. Soc. Am EL,129, EL135-140 DOI:10.1121/1.3556896, April 2011. Karimian, Ali, Caglar Yardim, Peter Gerstoft, William S. Hodgkiss, Amalia E. Barrios (2011), Refractivity Estimation from Sea Clutter: An invited review, Radio Science, RS6013, doi:10.1029/2011RS004818. Park, Cheolsoo, Woojae Seong, Peter Gerstoft, and WS Hodgkiss (2011), Fluctuating arrivals of short-range acoustic data, J Acoust. Soc. Am.,129, 98-103, DOI:10.1121/1.3514505. Traer, James, Peter Gerstoft, and W. S. Hodgkiss (2011), Ocean bottom profiling with ambient noise: a model for the passive fathometer, J. Acoust. Soc. Am., 129, 1825-1836, doi:10.1121/1.3552871. Xaver, Florian, Gerald Matz, Peter Gerstoft and Christoph Mecklenbräuker (2011), Localization of Acoustic Sources using a Decentralized Particle Filter, EURASIP Journal on Wireless Communications and Networking 2011:94, doi:10.1186/1687-1499-2011-94. Yao, Huajian, Peter Gerstoft, Peter M. Shearer, Christoph F. Mecklenbräuker (2011), Compressive sensing of the Tohoku-Oki Mw 9.0 earthquake: Frequency-dependent Rupture Modes, Geophys Res Lett., 38, L20310, doi:10.1029/2011GL049223. Yardim, Caglar, Zoi-Heleni Michalopoulou, and Peter Gerstoft (2011), An overview of sequential Bayesian filtering in ocean acoustics, IEEE Oceanic Eng 36(1), 73-91, DOI:10.1109/JOE.2010.2098810. Zhang, Jian, Peter Gerstoft,Peter M. Shearer, Huajian Yao, John E. Vidale, Heidi Houston, Abhijit Ghosh (2011), Cascadia tremor spectra: low corner frequencies and earthquake-like falloff at high frequencies, Geochem. Geophys. Geosyst., 12, Q10007,doi:10.1029/2011GC003759. Douvenot, Remi, Vincent Fabbro, Peter Gerstoft, C Bourlier, and J Saillard (2010), Real time refractivity from clutter using a best fit approach improved with physical information, Radio Science, 45, RS1007 doi:10.1029/2009RS004137. Harmon, Nicholas, Catherine Rychert, Peter Gerstoft (2010), Distribution of noise sources for seismic interferometry, Geophys. J. Int 183, 1470-1484, doi:10.1111/j.1365-246X.2010.04802. Jiang, Yongmin, N Ross Chapman, and Peter Gerstoft (2010), Estimation of marine sediment properties using a hybrid differential evolution method, IEEE Oceanic Engineering, 35, doi:10.1109/JOE.2009.2025904. Park,Cheolsoo, Woojae Seong, Peter Gerstoft, and WS Hodgkiss (2010), Geoacoustic Inversion Using Back-propagation, IEEE Oceanic Eng 35(4), 722-731, doi:10.1109/JOE.2010.2040659. Siderius, Martin, Heechun Song, Peter Gerstoft, William Hodgkiss, Paul Hursky, Chris Harrison (2010), Adaptive passive fathometer processing, J Acoust. Soc. Am, 127, 2193-2200. Yardim, Caglar, Peter Gerstoft and WS Hodgkiss (2010), Geoacoustic and source tracking using particle filtering: Experimental results, J Acoust. Soc. Am, 128, 75-87, doi:10.1121/1.3438475. Zhang, Jian, Peter Gerstoft, and Peter D. Bromirski (2010), Pelagic and coastal sources of P-wave microseisms: Generation under tropical cyclones, Geophys. Res. Lett., 37, L15301, doi:10.1029/2010GL044288. Zhang, Jian, Peter Gerstoft, Peter M.Shearer (2010), Resolving P-wave travel-time anomalies using seismic array observations of oceanic storms, Earth and Planetary Science Letters, 292, 419-427, doi:10.1016/j.epsl.2010.02.014. Brooks, Laura A, Peter Gerstoft (2009), Green's function approximation from cross-correlation of active sources in the ocean, J Acoust. Soc. Am., 126, 46-55. Brooks, Laura A, Peter Gerstoft (2009), Green's function approximation from cross-correlations of 20-100 Hz noise during a tropical storm, J Acoust. Soc. Am 125, 723-734. Huang, Chen-Fen, Peter Gerstoft and WS Hodgkiss (2009), Statistical estimation of source location in presence of geoacoustic inversion uncertainty, J Acoust. Soc. Am, 125, EL171-EL176. Taylor, Steven R., Peter Gerstoft, Michael C. Fehler (2009), Estimating site amplification factors from ambient noise, Geophys. Res. Lett., 36, L09303, doi:10.1029/2009GL037838. Traer, James, Peter Gerstoft, H.C. Song, and William S. Hodgkiss (2009), On the sign of the adaptive passive fathometer impulse response, J Acoust. Soc. Am., 126, 1657-1658. Yardim, Caglar, Peter Gerstoft and WS Hodgkiss (2009), Sensitivity analysis and performance estimation of refractivity from clutter, Radio Science, 44, RS1008, doi:10.1029/2008RS003897. Yardim, Caglar, Peter Gerstoft and WS Hodgkiss (2009), Tracking of geoacoustic parameters using Kalman and particle filters, J Acoust. Soc. Am,125, 746-760. Zhang, Jian, Peter Gerstoft, and Peter M. Shearer (2009), High-Frequency seismic noise driven by ocean winds, Geophys. Res. Lett., 36, L39302, doi:10.1029/2009GL037761. Roux, Philippe, Karim G Sabra, Peter Gerstoft, WA Kuperman, and Mike C Fehler, P-waves from cross correlation of seismic noise, AGU Geophysical Research Letters, 32, L19303, doi:10.1029/2005GL023803, 2005. (PDF). Article in Science news about our work Seismic noise can yield maps of Earth's crust, article in Science News 11 June 2005. D'Spain,GL, GL Rovner, Peter Gerstoft, WA Kuperman, and WS Hodgkiss, Determination of waveguide invariance in general environments, U.S. Navy J. Underwater Acoustics 51(1), 123-142, 2002. Peter Gerstoft, "SAGA Users guide 2.0, an inversion software package," SACLANT Undersea Research Centre, SM-333, La Spezia, Italy, 1997. 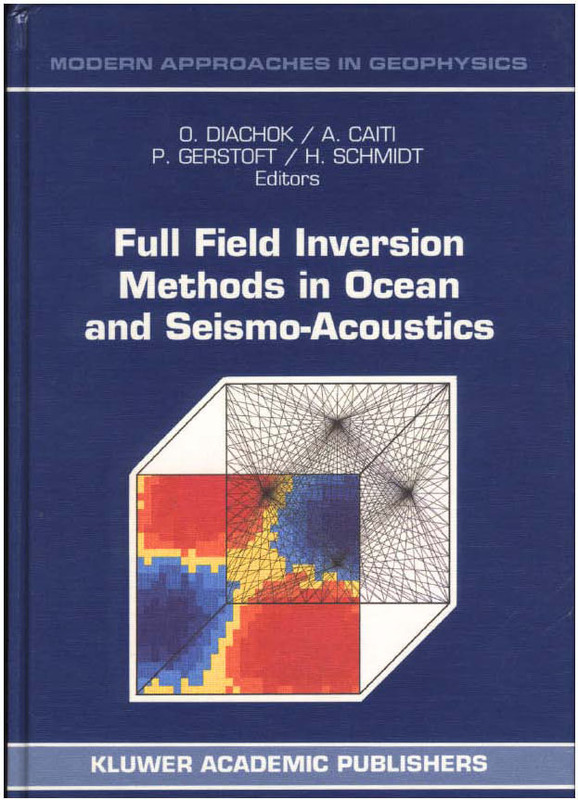 Orest Diachok, Andrea Caiti, Peter Gerstoft and Henrik Schmidt (Editors), Full field inversion methods in ocean and seismo-acoustics, (Kluwer, 1995).